Wow Denmark. Very neat. Even the piles of dirt I found were very neat. Australia is sloppier, less particular, more rugged. Motorcycles around Sydney - ones you might not find in the US, and other oddities. I love this one. It's a 400cc Honda with ABS and a really nice seat. The red white and blue version is especially nice. There is more demand than parking downtown, which makes this alternative transport frustrating at times. I've paid about $300 in tickets in 3 years parking down there. This guy rides around the CBD sharpening knives from his motorcycle. He said he'd been doing it forever, I remember maybe 25 years or something. Royal National Park is a place where many young motorcyclists go to die. I found this Aprilia in the bushes just off the road at Flat Rock Creek. They left the fairings and a decent set of forks behind. This one is rare. I know a guy who has two of them. Suzuki Gamma, an 80's 500cc 2-stroke parallel twin. And Deus Ex Machina - a great alternative shop in Sydney with excellent food also. For being such a chique place their shop is very good and competitively priced. *Nope, was about 2x the price of other shops. They make some very cool bikes. A huge Suzuki I bet you can't get in the US. But maybe you can, I don't know. I like it. But I like the 400cc Honda much more. We had a good full weekend. Vis in the water is still bad from storms so no diving, but we went down to Royal National Park and did a couple short hikes at places we hadn't been before. Flat Rock Creek, and a fire trail near the highest elevation point in the park. We crossed the creek to eat lunch in the sun on some rocks. On the way back I got lost and separated from Karin, and had a good little adventure hurting my hand and climbing on things. Today we just went to the beach. On the way I found an old skateboard and took it with us. It was in pretty bad shape, looks like dad ran it over with the car because the bolts in the trucks were both bent to one side. I re-aligned them so the bend was front-beck instead of to one side and now it's ok. Still just a crap K-Mart board but fun for going down hills! Not steep ones. This is the bent bolt. It's a pretty big bolt, must have been backed over by dad (or maybe mom). Ah and I adjusted our front door today (psht you care). 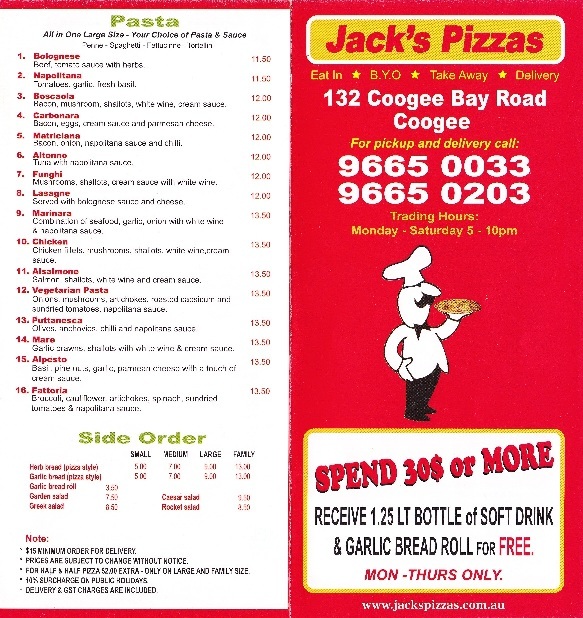 So, after a long time, and a lot of eating pizza, our favourite is Jack's Pizza here in Coogee. Doughboy is also good, but their crust is too thin and even an XL will not feed two very hungry people. Jack's has thick crust options, and I quote "we will make it as thick as you want it." But they need more salt in their dough to make a good thick crust option really. 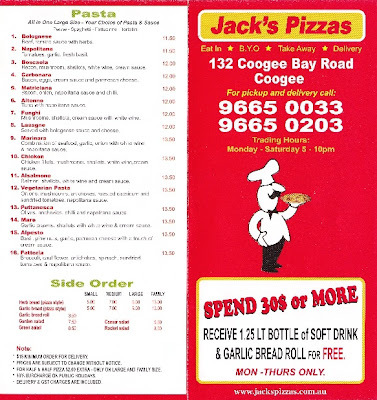 We affectionately refer to Jack's as "the dead bird pizza store" because the first time we ate there there was a dead pigeon on the floor under a table. I think it had just flown in and died. 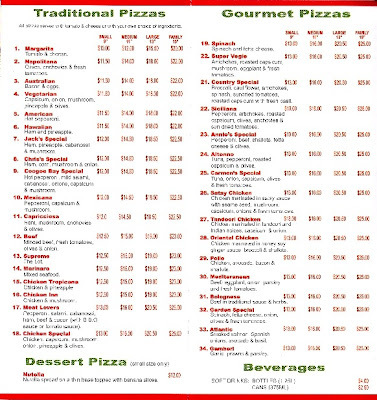 Anyways it's not still there and the pizza is great. Except on Sundays, when they're closed. 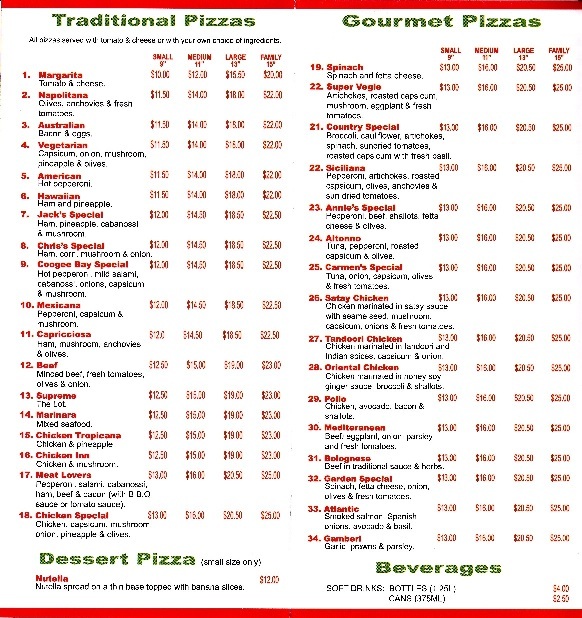 UPDATE: Sven's pizza is small and very expensive. It is very tasty, but a large is just enough for one hungry adult (maybe).